* Maybe... provide real-time enforcement of parcel permissions. That is, allow parcel owners to set a paranoid bit "I don't want anyone, or these specific people, from putting stuff on my parcel"
* Once that is done... then perhaps we will allow you to make prims/objects as large as you want... as long as they fit on your parcel. That said, I turned to my good friend and one of the most entertaining, clever and talented builders I know, Douglas Story, to share his thoughts (and those of most NPIRLers) on this topic. Thank you, Douglas. 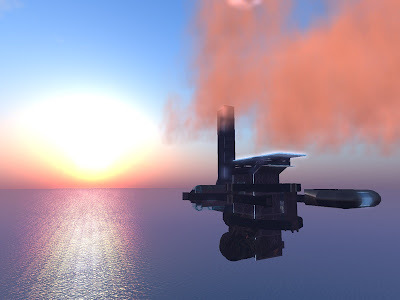 Exactly 200 days ago today, Michael Linden posted “The Big Prim” problem on the oh-fish-all Second Life® blog in which he invited residents' comments on the idea of doing away with megaprims. “Megaprims” are particular varieties of Second Life’s basic building blocks that are… well… they’re big. Huge. Mega. Gigantic. They were created by virtue of an exploit in the Second Life code, and although megaprims were never banned outright, they have been frowned upon generally by the Linden Lab gods. Despite that, these king-size building blocks have been widely used all over the grid, and have been especially effective in art builds. 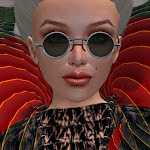 Michael Linden’s original blog post stirred up a huge storm of protest and comment, including a piece on this blog that Evil Slavedriver Bettina (that’s her official title, you know) forced me to write. I listed a number of the great builds that would disappear if megaprims were to vanish from our virtual world. At that time we begged the Powers That Be to preserve megaprims, but now we’ll add another non-negotiable demand… er, I mean, request: please give us megaprims that are resizable and fully editable. You see, currently if one attempts to change the size of a megaprim by even 1 centimeter, the prim will snap back to the normal maximum size of ten meters. Most annoying. 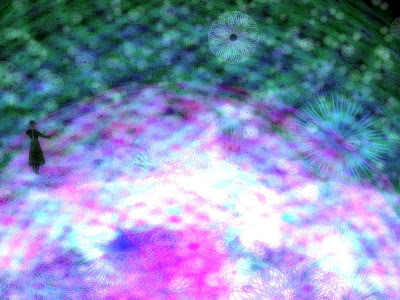 Making megaprims resizable will produce a new wave of wonderful creativity, says I. 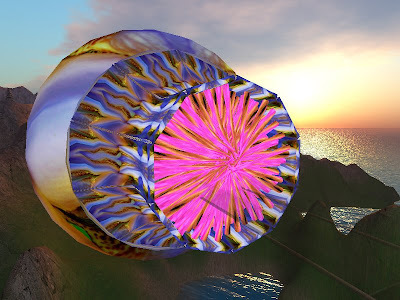 One of the chief concerns that Linden Lab had with the use of megaprims was the fear that they would not work well with the new Havok 4 physics engine that had yet to be rolled out. But, as AM Radio commented earlier today, it’s a very good sign that Havok 4 is now active over much of the grid and that the Lindens have not banned megaprims outright. So, we repeat our call for Linden Labs to 1) make megaprims officially sanctioned, and 2) make them fully editable. What follows is a series of pictures of just some of the splendid builds using megaprims that have risen up since the original controversy arose 200 days ago. This list is by no means complete or authoritative, but is rather meant as an indication of the richness that would be lost without these now-essential building elements. DynaFleur - Teleport directly from here. Because my ego is the size of any artist’s (that is, roughly as big as All Outdoors) we’ll start with one of the pieces I created together with a motley crew of all-stars. If you visit, use the damned dance balls! 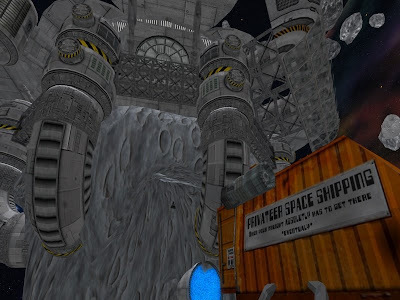 Syncretia by Alpha Auer - Teleport directly from here. As you can see, I muffed the landing. Again. 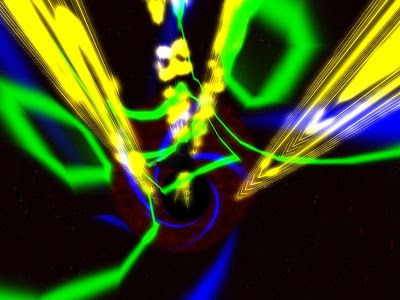 Tunnel of Light by Spiral Walcher - Teleport directly from here. Spiral also makes top hats with stuff in ‘em. Stuff besides your head, that is. I’d show you a picture of one, but the hats don’t involve megaprims – which is amazing considering the fact that a lot of artists wear them. David Rumsey Maps by Nathan Babcock - Teleport directly from here. This remarkable place is a tour-de-force of megaprim usage. Although I elected to photograph something else for this piece, the four sim complex features scores and scores of sculpted megaprims with real world terrain data mapped into them; all this forms the shape of Yosemite Valley. Remarkable. 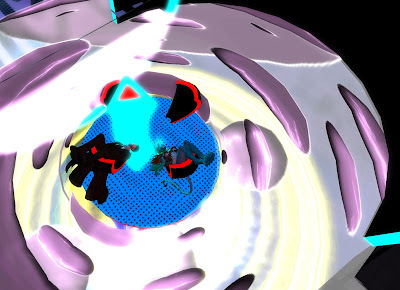 Space Colony Necronom by Oni Horan - Teleport directly from here. If you visit here, you really, really want to make sure you’re wearing underwear. Get me drunk enough and I’ll tell you how I know. Zero Point by Sabine Stonebender - Teleport directly from here. 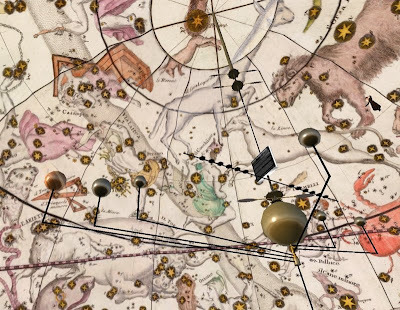 Planet Mongo by Lumiere Noir - Teleport directly from here. 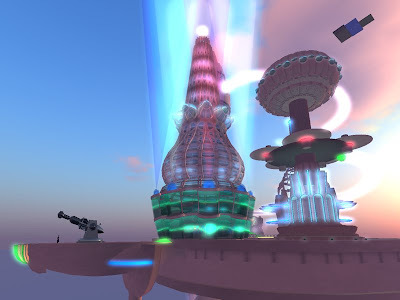 Privateer Island by Aley Arai - Teleport directly from here. Kaleidoscope by Juria Yoshikawa - Teleport directly from here. Chouchou by Juliet Heberle and Yuki Aabye - Teleport directly from here. The Far Away by AM Radio - Teleport directly from here. And lastly…..this much-loved, much-photographed and much-visited marvel of spare beauty. 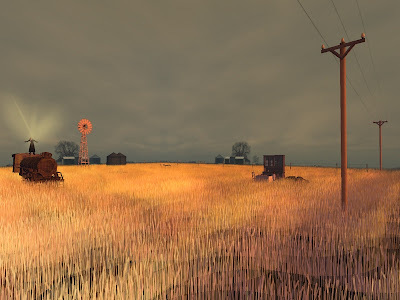 One of the few places in Second Life I return to again and again. 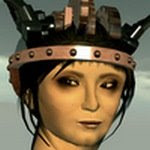 Bettina - i'm happy to report that just TODAY i finished the code to allow parcel owners to return objects that merely overhang their parcel boundaries. you'll have to check with Andrew to find-out what more needs to be done before we fully liberate the giant prims - but things are looking bright. Excellent news, Qarl! Will do. It should be noted that Havok 4 brought the added benefit of making mega prims proper solids with respect to any cuts, hollowing or profile changes made. This alone has dramatically increased their usefulness as building elements since we no longer have to keep them phantom, but can easily walk along the inside of a hollow mega prim or the sloped outside of a cut torus. I hope, I really do keep hoping for an increase in the maximum prim size. But experience has shown that this will probably be a slow forward movement. I wouldn't be surprised to pass day 500 with it still being discussed but not yet deployed. Nonetheless, always great to hear bits of good news like qarl's above!